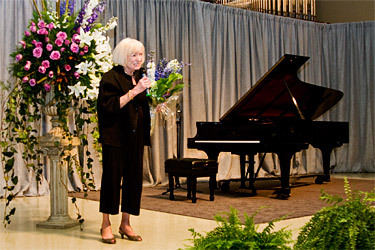 On Sunday evening, October 5, more than 300 guests attended an exclusive piano concert in honor of Mrs. Margrit Mondavi and the memory of her late husband, Robert. Piano Fantasia, sponsored by Pacific Union College and held at Paulin Hall, paid tribute to the Mondavi's visionary leadership and passion for music arts in the Napa Valley. "Margrit, this is a woman who has touched my heart—she is so dear to me, and the chance to honor her is the most exciting thing on earth," said master of ceremony Asher Raboy during his welcome. Raboy is director of music for the Napa Valley Symphony and faculty in the PUC music department. "If there are arts happening, not only did she put her time and money into it, but she put her beautiful spirit, her joy, her love and made the whole thing a glorious experience." The intimate concert welcomed award-winning pianists Rebecca Bogart, Elben Capule, Alex Chien, Daniel Glover, Hugo Kitano, Mack McCray, William Wellborn. The concert celebrated a range of experience and age; three of the performers are young students in elementary and junior high school and college. "The amount of talent on the stage—and to think it's basically in our community. It's rare to have that many talented artists in one country! We saw future, past, and present on the stage tonight and everyone belonged up there," said Raboy. The concert was a feast for music enthusiasts, featuring pieces by Chopin, Gershwin, and Rachminoff to name a few. The thrilling final piece, "Concert Arabesques on the Beautiful Blue Danube" by Schulz-Evler and performed by San Francisco artist Mack McCray, brought the audience to their feet for a standing ovation. Following the concert, Mrs. Mondavi took the stage. "I am so touched, I'm overwhelmed. I know my love Robert is watching it from his cloud. For this fabulous, unbelievable moment, I thank President Osborn, [PUC] Board of Trustees, the great faculty of this famous school. I am really touched," said Mrs. Mondavi. "My family, my friends who have come to this event—to see talent, just the greatest talent, the gift of music, which touches us all so deeply. And when I see these young people, I think that the troubles we have in this world and every day, there is hope, and there is hope in these young people that are going to bring so much joy to the world in the future." The invitation-only event was produced by Mondavi family friend Lillian Wu of San Francisco, and it drew guests from all over the bay area, many of whom are friends of Mrs. Mondavi. The college also invited Valley friends and neighbors. Meg Scrofani, who lives in Angwin, has been to the campus numerous times for events, but considered Piano Fantasia a "debut" for PUC. "Wake up Valley to what we've got here! If we were in San Francisco, we would have paid $150 to watch this concert," said Scrofani. Said Judith Rufenacht, a music major at PUC, "It was wonderful. I liked everything, and it just got better and better and better. We usually have to travel to San Francisco to Davies Symphony Hall for this type of concert!" At the heart of Piano Fantasia was a beautiful Steinway, on which each artist performed. It was donated to the college by David Tsao, who graduated from the college in 1999. The gift inspired the Piano Project, a goal to replace 90 percent of the current performance and instruction pianos that were initially installed more than 30 years ago. Tsao enlisted the help of Wu, a San Francisco artist and avid supporter of music arts. In the process, PUC asked to celebrate the commitment to excellence in music and music education by honoring Mrs. Mondavi. "We were thrilled to be able to honor such an important family in the Napa Valley. They have been instrumental in fostering the arts, and their efforts have had a rippling impact in the area," said Richard Osborn, president of PUC. The Mondavis are the founders and benefactors behind COPIA: The American Center for Wine, Food, and the Arts; and are founding supporters of the Napa Valley Opera House restoration project and the Oxbow School, a new art school in Napa. Mrs. Mondavi also started several music festivals in the Valley. Founded in 1882, Pacific Union College is a fully accredited four-year college, located in California's Napa Valley. Affiliated with the Seventh-day Adventist Church, PUC offers a Christ-centered experience to approximately 1,400 students. PUC's overall program is ranked in the top tier of Western regional baccalaureate colleges by U.S. News & World Report. More than 200 students, faculty, and staff are involved in music arts at PUC as majors, members of a music group, or through private study. In addition, people of all ages from the Napa Valley participate in music programs and lessons through the Paulin Center for the Creative Arts, started by professor Noah Paulin in the early 1900s. Over the years, hundreds of musicians from the greater Napa community have studied with instructors from the Paulin Center for the Creative Arts.